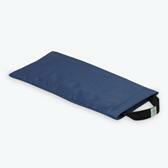 This Yoga Sand Bag is a great prop to help strengthen and lengthen poses. Use the sandbags to add calming weight to your practice. Contrast nylon handle at end with Gaiam logo patch. Features inner lining zipper for easy fill. Helps strengthen and lengthen poses. Adds weight to your practice.